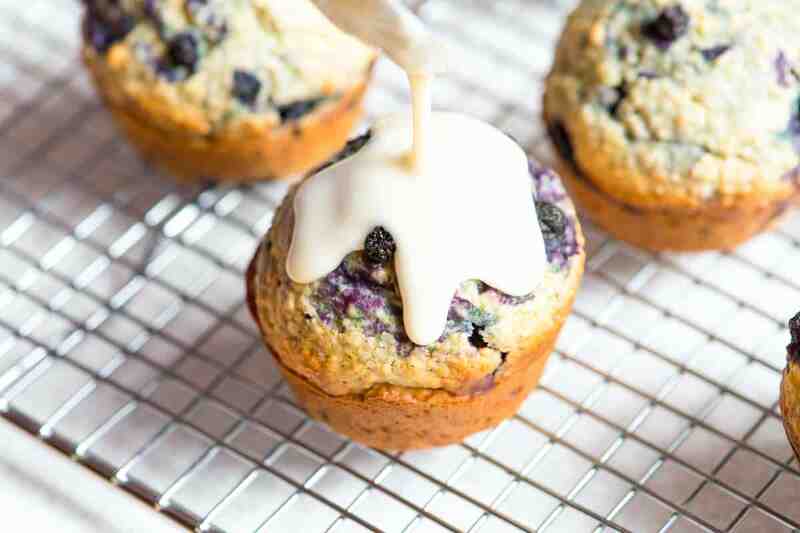 Blueberry Muffins made with fresh ginger, fresh or frozen blueberries and oats. 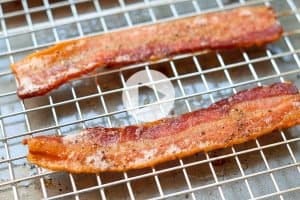 Plus a spoonful of vanilla glaze to make everything that much better. Jump to the Ginger Oatmeal Blueberry Muffins Recipe or read on to see our tips for making them. We can’t get enough of these muffins — the ginger and vanilla make the batter insanely delicious. There’s a nuttiness from a couple tablespoons of sesame seeds as well as oat flour — don’t worry, it’s easy to make at home. These are not your average muffins. They are perfect for breakfast or snacks — we actually find them to be more filling than your usual muffin. 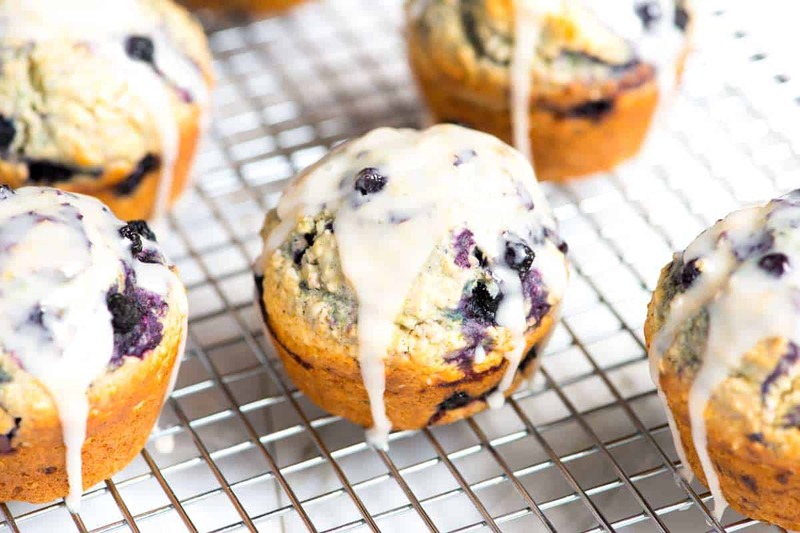 You might want to check out our most popular muffin recipe on Inspired Taste — Ridiculously Easy Blueberry Muffins Recipe. 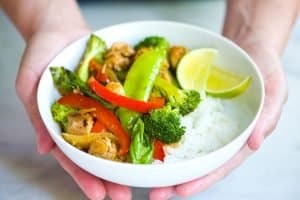 You only need one bowl to make them! 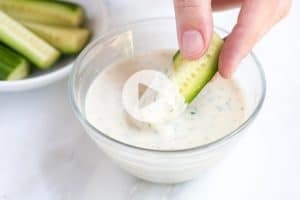 We’ve even included a quick recipe video showing you how. I mentioned we add oat flour to these. 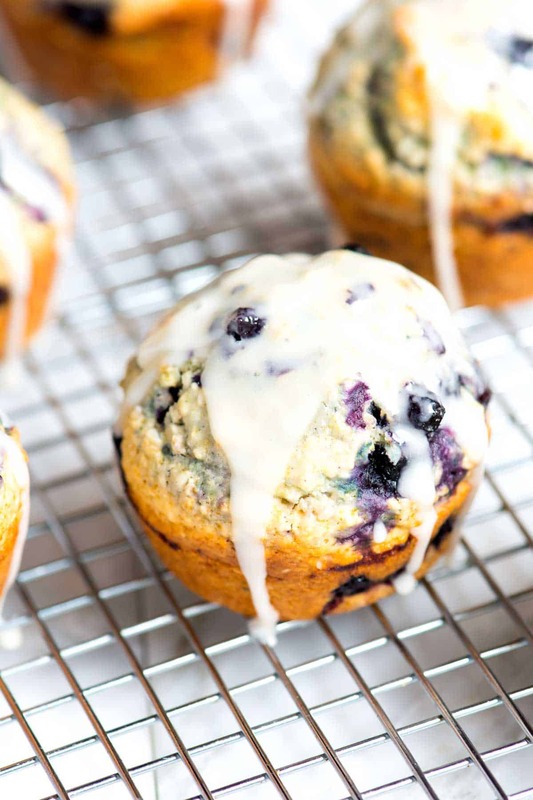 Oat flour adds a mild nutty flavor, but still takes a backseat to vanilla, ginger and the blueberries. It’s soft and behaves nicely, just like wheat flour. 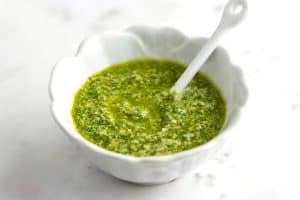 To make it, simply throw it into your food processor or blender and pulse until finely ground. It doesn’t need to be ultra fine — ours usually isn’t and it works perfectly fine in these blueberry muffins. I should mention that you can buy oat flour — we like Bob’s Red Mill. Anything you buy will most likely be finer than homemade. That’s okay. We add the oat flour to some all-purpose flour, baking powder and salt. We throw in sesame seeds, too. I know not everyone loves them, so feel free to leave them out. They do add a really nice nuttiness, though. We always have sesame seeds on hand and make our own homemade tahini often — that’s just a paste made from sesame seeds. It’s a key ingredient to this popular hummus recipe. The wet ingredients are just as simple. Sugar, oil, an egg, vanilla and 2 whole teaspoons of freshly grated ginger. If you can find fresh blueberries, use them. If not, do what we did and use frozen. We really like the frozen wild blueberries (Wyman’s — in the blue bag). While the muffins are still warm, we add a simple glaze made from powdered sugar, milk and vanilla. It’s mouthwatering to watch it slowly drip down the muffins. After glazing it’s up to you when you eat them. They are great warm, but do last a while at room temperature. I’d suggest leaving them out a day or two at room temperature, but if you need them to last longer, store them covered in the fridge. When you’re ready to eat one, it doesn’t hurt to microwave for a few seconds to warm it up again. 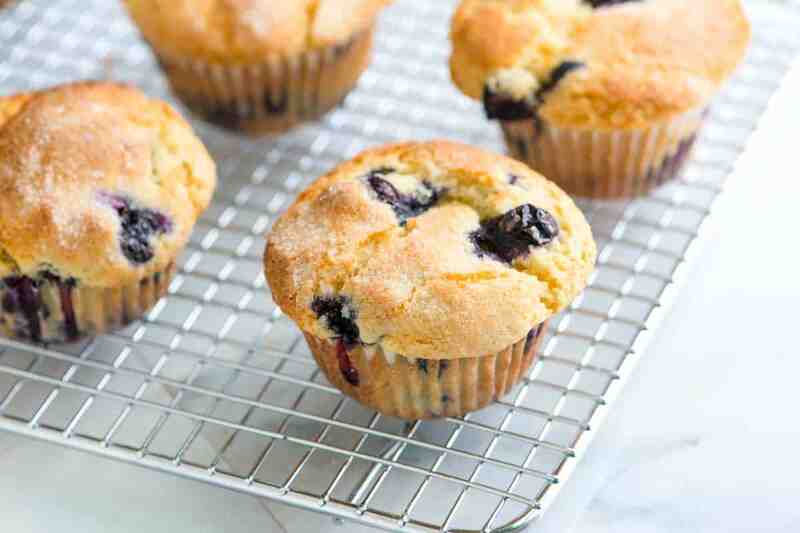 These blueberry muffins can be made with fresh or frozen blueberries. We throw sesame seeds into the batter, I know not everyone loves them, so feel free to leave them out. They do add a really nice nuttiness, though. Gluten-free Muffins: If you’re wondering if you can replace the wheat flour completely with oat flour in these muffins, you can. The muffins will not rise as much and will be on the drier/heavier side. Adding a mashed banana or some grated zucchini is a good idea. If you’re doing this to go gluten-free, make sure you look for gluten-free oats. Ginger: If you don’t have fresh ginger on hand, use 1/2 a teaspoon of ground ginger. These were awesome thank you so much! I used coconut oil, added an extra teaspoon of ginger and at least a 1/2 a cup more blueberries, great amount a blueberries still could have used more ginger. Very good muffin instead of fresh ginger I had chopped ginger in oil used that instead 1 generous tsp. Hi, after I tried the blueberry muffin with success, I made the ginger blueberry oatmeal muffin. It’s soooo delicious. It’s the 1st time I write a comment and I’m extremely happy with this website. I discovered it by coincidence and I think I will try all recipes HEHE Big thanks and hats off for Joanne & Adam for sharing all those recipes in a clear and easy way especially for those who are bad in baking (like me)😃 Thanks again!! Delicious, perfect, but next time I will use a little less sugar. Thank you for a lovely recipe that turned out perfect the first time in making it. Followed the recipe.Thought these were so bad they went in the garbage. Very Disappointing. Delicious! I used 1 cup oat flour, 1/2 cup ground flaxseed, 1/2 cup flour. Thank you for your easy recipe. I will be making these again! Haven’t made these yet, but they sound delicious. I would nix the glaze though. Don’t need the extra sugar. Can you use steel cut oats instead of rolled oats esto to make the oat flour? Hi Debey, You might have to experiment with this one. We’ve never tried to make oat flour using steel cut oats. I’m worried that they will be difficult to blend since they are much tougher than rolled oats. Can you use coconut oil if you dont have any other oil? Excellent recipe! Made it for breakfast and enjoyed every bite. Added some chia and nuts. Will make again soon! Five stars! These have become my family’s favorite muffins ever! They always turn out super moist and delicious. I love that they are not too sweet and the addition of sesame seeds is genius! I use soy or almond milk and usually add double the amount of ginger because I like the punch. Thank you for a wonderful recipe! After making the easiest blueberry muffin recipe a few times with good results, I decided to try this recipe out. I love the addition of ginger and oat flour. Nice twist on a classic. Hi, is it necessary to add ginger? Are there alternatives? You can leave it out if you prefer. We like the spice it adds.